In retrospect of the long and curious journey of my spiritual life, I can see now how my seeking after God has been a quest that has taken the majority of my years on this Earth. But it was only sixteen years ago when that seeking coalesced and crystallized into a choice to follow after Christ. But the Lord provides. And He sustains. Always. Sometimes in ways that we can't fully appreciate until a long time later, and that is certainly what I have found in recent years especially. 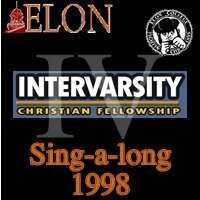 Something that was an encouragement for me during those first few years were the brothers and sisters at Elon College's InterVarsity Christian Fellowship. Every Tuesday night was an evening of praise and worship and for some reason or another they even tolerated a fallen and frail guy like me. Helped me, even. A lot. Well, there was a bunch of singing those nights, and waaaay back in 1998 there was a whole night's "recording session" of those songs. Over the years the tapes were converted into MP3 files for digital dispersal among friends. I've been carrying them around on my iPod for more than six years now. When I went through an especially rough patch two years ago, these songs became one of the few things that helped me hold onto God's promise that the darkness would end. So, I can readily attest that there's some uplifting material here. Geoff Gentry, not just a true brother in the Lord but an all-around kewl dude and techno-wunderkind, has made ALL of those recordings available on his website! There are two zipped-up files to download: one is the "main" body of 29 songs and then there's a "bonus" archive with 6 songs. My voice is somewhere in the larger collection but it's (thankfully) drowned out by those of much better singers. Anyhoo, these have been a blessing to me over the years and if you need something uplifting, maybe they can be a blessing to you too.